This month we pack our travel bags for the red dirt roads that can only belong to Prince Edward Island, better known as PEI. Early explorer Jaques Cartier described it as “The finest land ‘tis possible to see. Full of meadows and trees,” … and I would have to agree! Aside from its’ trademark red dirt roads, PEI is also the home of the red-haired Anne from the best-selling novel Anne of Green Gables, written by Lucy Maud Montgomery. This novel, set in PEI, illustrates so nicely the beauty and serenity in Canada’s smallest, but perhaps prettiest province. Food industry is big business in PEI and is the most important contributor to the province’s economy. Apart from the delicious seafood and fish that swim in the waters surrounding the island, potatoes are the star attraction growing in the rich red soil. The growing season greets “new” or “early” potatoes in late July but sees the bulk of the crop harvested starting in September through until October. There are four main types of potatoes, including Russets, whites, reds, and yellows, all used for slightly different purposes, depending on the colour of their skin and flesh, moisture content, starch/sugar content, texture and flavour. Hey! Wait a minute! Aren’t potatoes bad for you? “Good/bad”, “clean/dirty” … I hate how we dichotomize food these days! But that’s a rant for another day! No. Potatoes aren’t BAD for you. Has anyone heard of the word "moderation"?! Potatoes have gotten a bad rap in the past and I believe that is mainly because of all of the not-so-healthy ways that we prepare and serve them. Take for instance, mashed potatoes made with butter and cream or cream-cheese OR poutine with cheese curds and gravy OR a baked potato with full-fat sour cream, cheddar cheese and bacon bits. You don't have to be a rocket scientist to figure out that this may not be the best way to eat these gems. Potatoes do contain carbohydrates (mainly in the form of starch) but carbs aren't evil and won't kill us, contrary to popular belief. In fact, a recent systematic review did not find convincing evidence of an association between the intake of potatoes and risk of type 2 diabetes, obesity or cardiovascular disease. The researchers did note that this warrants further study as the quality of the individual studies used was poor. In summary, potatoes are a healthy food with lots of good nutrition but you need to keep your portion in check. Moderation my friends, moderation. You will always find potatoes in my house! This 3-ingredient recipe is packed with flavour and nutrition! These roasted mini potatoes make for an easy addition to any weeknight supper or can serve as a simple way to dress up your spuds and impress your weekend guests. Wash potatoes and dry well. Cut each mini potato in half. Place potatoes in a medium sized mixing bowl or large bag. Pour the pesto overtop of the potatoes and place the lid on (or close the bag) and shake until all potatoes are covered. 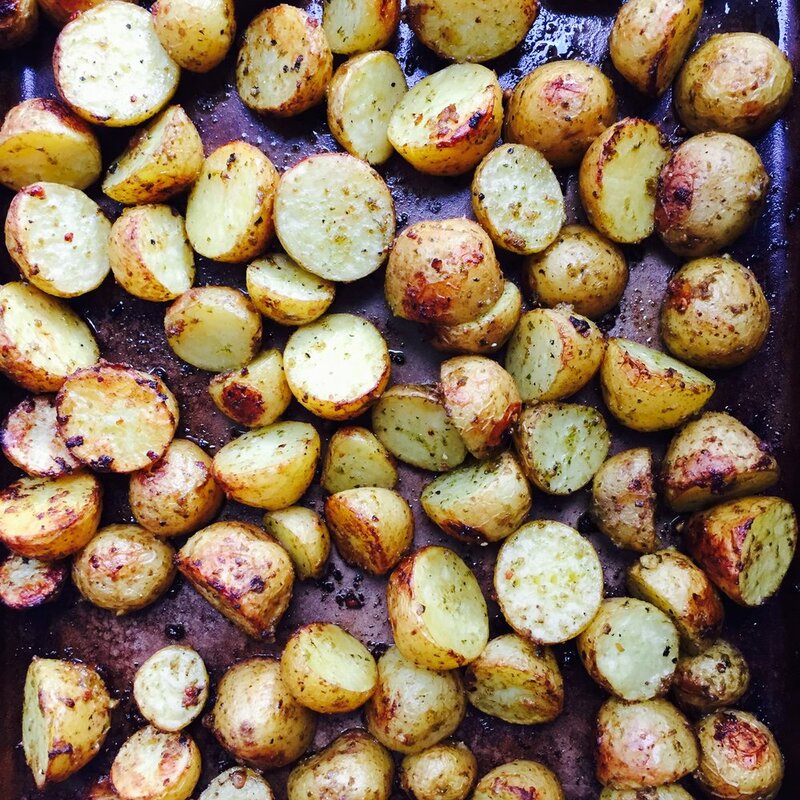 Spread potatoes in a single layer on a baking sheet and place in the oven. Let roast for 35-40 minutes or when a fork is easily inserted. Serve hot! Government of Prince Edward Island. Accessed August 28, 2017 at www.princeedwardisland.ca. PEI potatoes. Accessed August 28, 2017 at www.peipotato.org. USDA Food Composition Database. Accessed August 28, 2017 at www.https://ndb.nal.usda.gov/ndb/.